Berlin offers extraordinary and unique sightseeing opportunities. A hub of artists, nightlife and trendy neighbourhoods, Berlin fittingly offers extraordinary and unique sightseeing opportunities. 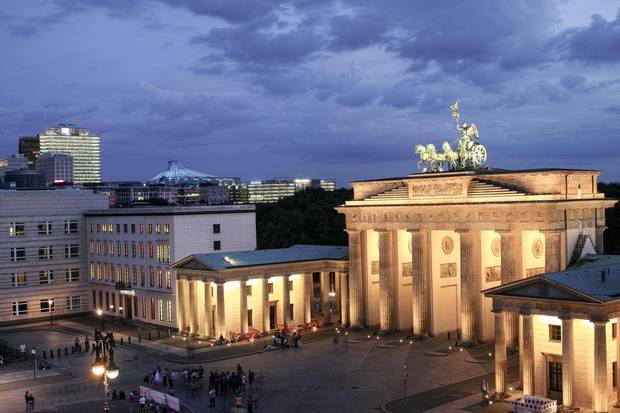 Here are five of the best city tours with a twist in the German capital. With technological advances becoming more affordable, sightseeing has reached a new level. Since the spring of 2016, When in Berlin Tours, in co-operation with Time Rift Tours, has been offering a virtual-reality experience of the Berlin Wall in an astonishingly accurate 360-degree, hyperrealistic immersive stereoscope. What that means is you'll be given a large set of goggles (never mind the funny or envious looks of passersby) to explore Berlin's past with help from the future. Through your device, you'll see the former "death strip" along the Berlin Wall at Bernauer Strasse, just as it looked in 1965 in the same spot. Observe the soldier with his gun, ready to shoot, or the sharp barbed-wire fence, set to electrocute anyone who touched it. Fast-forward to 1979 and you can see new high-rise apartments in West Berlin, while the grey, war-torn buildings remained the same in the East. A lot of work and meticulous research by academics have gone into recreating this particular section of the Berlin Wall, as the virtual reality aims to document history and not trivialize it by turning it into a video game. More than 800 people have so far experienced the Berlin Wall at 360 degrees. The virtual-reality tour is typically offered as an add-on to any other private tour by the company and takes about an hour. Beneath the streets of Berlin lies an extensive network of tunnel systems and subterranean walkways as well as bomb shelters and unused subway stations. The Dark Worlds Tour by Berliner Unterwelten e.V. takes you on a 90-minute guided walk through one of the few remaining civilian air-raid shelters as it was left after the war. The bunker below Gesundbrunnen subway station is not for the faint-hearted as you'll walk through claustrophobic rooms, narrow tunnels and past heavy steel doors – sometimes in pitch-black darkness. It's a strange world, filled with bunk beds and benches for sleeping, communal bathrooms and medical-care areas (among other emergencies, children were born here), all insulated by layers of metre-thick concrete – although you'll notice the vibrations and noise of the nearby metro rumbling. Learn about the Allied bombing raids that destroyed up to 80 per cent of Berlin's city centre, see memorabilia from the 1940s and get an insight into the lives of civilians, above and below ground, during this turbulent time. Berliner Unterwelten e.V. was founded in 1997 and is run by academics, students, amateur historians and a few pensioners who experienced the war themselves. The tour takes 90 minutes. Price: $17; tickets only available on site, no children under seven; berliner-unterwelten.de/en. German food may be best-known for bratwurst, beer and sauerkraut, but Berlin's cosmopolitan nature attracts innovative chefs from around the world. If you're pressed for time or simply can't settle for only one restaurant, the Gastro Rallye East is the perfect solution. Led by your personal guide through Berlin's culturally diverse Mitte district, you'll eat your way through various international cuisines at a different location for every course. You may even be able to walk some of the calories off while you explore the history of the neighbourhood, street art, food trends and the best in food and international wine. Restaurants visited could be Italian or Thai or Japanese – the company is known for being ahead of culinary trends, so be prepared to be surprised. Gastro Rallye is the brainchild of Henrik Tidefjard, a Swedish native who has been running the tours since 2004. His company, Berlin Agenten, offers a number of tours from graffiti workshop to urban architecture and secret club-hopping at night. Gastro Rallye East takes approximately four-and-a-half hours and includes four courses and drinks. Price: $360 a person; berlinagenten.de. Get out of the tourist hot spots and explore a more low-key neighbourhood such as Prenzlauerberg with a tour from Alternative Berlin. Berlin has developed a reputation for being creative, cheap, diverse and edgy. Away from the tourist spots, you'll find a different environment of subcultures, working-class districts and artist hot-spots. One company that specializes in tours to these areas is Alternative Berlin. Its Real Berlin Experience will take you into flamboyant and multicultural neighbourhoods such as Prenzlauer Berg, Mitte, Friedrichshain and Kreuzberg for a more local perspective. All guides are practising streets artists and show you locations from the East Side Gallery, the public face of Berlin's street-art scene along a restored section of the Berlin Wall, to a fake Banksy, mural-art projects and works by Belgian artist ROA. Good footwear is recommended as you cross urban farms, guerrilla gardens, concealed courtyards and underground galleries in search of hidden creative spaces. Street art, both beautiful and provocative, is a key part of Berlin's cultural identity. In a city with such a long history of state intrusion into private lives, from the Nazis to the East German secret police Stasi, the tour highlights the turbulent times, both before and after the Berlin Wall came down, as well as the current gentrification. The Real Berlin Experience concludes, German style, in a legendary Prata beer garden. The tour runs on Tuesdays, and from Thursdays to Saturdays at 12 p.m., and lasts four-and-a-half hours. Price: $18 a person; alternativeberlin.com. Trabi Safari lets you drive a Trabant, the notorious East German car that makes a noise as loud as a lawnmower, through downtown Berlin and past sites such as the Reichstag and the TV Tower. For some, it was the worst car ever produced. For others, owning one meant the end of a 12-year-long wait – either way, the East German Trabant is a car like no other. Although more than three million vehicles were manufactured, this matchbox of a car has become a rare sight on the streets of Germany since its production came to a halt in 1990. Join a Trabi Safari in Berlin for your chance to master the two-cylinder, two-stroke engine that makes a noise as loud as a lawnmower. Attention is guaranteed while you chug away through the German capital. In a convoy of several Trabis driven by fellow nostalgic comrades, you'll steer past the Brandenburg Gate, Checkpoint Charlie, the Reichstag, Berlin Cathedral, the TV Tower and the East Side Gallery, the longest part of the Berlin Wall still remaining, all the while the car's internal sound system transmits the running commentary of the tour leader. You might struggle with the unfamiliar gear stick, a lever positioned just behind the steering wheel, or the different biting points of the clutch and brake pedals, but rest assured, no Trabi gets left behind at corners or traffic lights. After navigating through Berlin successfully, you'll receive your very own Trabi-Fuhrerschein (driving licence). The two tours on offer are one hour and 15 minutes in length, or two hours and 15 minutes. Prices: $74 for Berlin COMPACT, $119 for Berlin XXL; trabi-safari.de.